Given our bent towards traditional cocktails modified to incorporate fresh, local flavors, Honolulu is one of the best cities in America to go out for a drink... which means folks in Honolulu experience one of the best problems ever: being spoiled for choice. So we rounded up the best of the best -- from one of our wonderful new craft brew pubs to some exceptional cocktail bars -- to help you figure out the best spots to grab a drink tonight. The warm wood and leather tones in Bar Leather Apron make it the perfect place to sip on seriously beautiful cocktails. 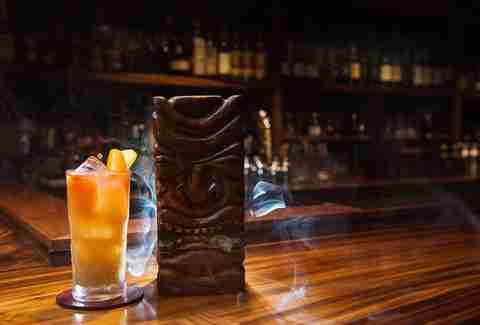 Bartender Justin Park’s award-winning E Ho’o Pau Mai Tai is definitely not your average mai tai. It arrives covered in a glass bell and is infused with kiawe smoke. 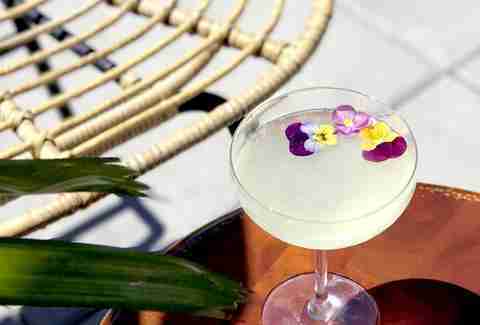 Asian flavors, such as shiso, yuzu, lemongrass, and matcha have been magically incorporated into a variety of oh-so-delicious cocktails. Walk-ins are welcome, but definitely email ahead for reservations. Not only is Peter Merriman’s Moku Kitchen known for being focused on locally sourced food, but this place is also home to a 46-foot bar that boasts 36 craft beers as well as a unique keg wine system that offers 12 biodynamic and sustainable wines on tap. Happy hour is daily from 3pm-5:30pm featuring drink specials and 50% off all apps (with the exception of items with raw fish). It’s a great time to try the Monkeypod Mai Tai, which is well-balanced with a touch of tart flavor from the honey-lilikoi foam, or one of those perfectly chilled -- 29 degrees Fahrenheit -- beers on tap. With live music every day, it’s a great place to bring a group. This is a place to enjoy a cozy, indoor atmosphere complete with brick walls and comfy leather couches, or get a breath of fresh air out on the patio where the fern-adorned wall brings a bit of relief from the otherwise concrete urban jungle. No matter where you end up sitting, you’re in for a treat -- the Tchin Tchin Bar not only has an extensive wine list, but also offers cocktails and a handful of carefully selected beer and ciders. Small food dishes are perfect accompaniments stinky cheeses, fancy cured meats, salty olives, and more. 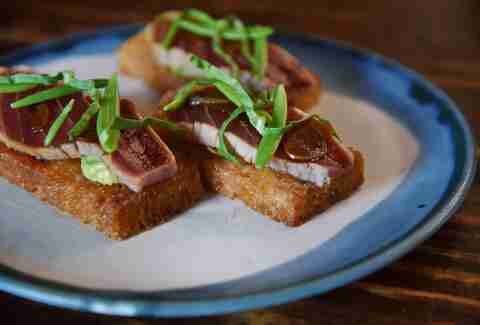 The ambience in Bevy is dark meets industrial, but the food and drink offerings are refined and refreshing. Try Christian Self’s Mai Thai, a twist on the traditional mai tai, but mixed with lemongrass and a candied ginger foam, which is sweet. Or the Tequila Mockingbird, a spicy combination of tequila, ancho chili, papaya, and turmeric -- it goes down smooth and fast. Plus, you can’t beat the $1.50 happy hour oysters and $5 cocktails every Tuesday-Saturday 4pm-7pm. There’s something about public karaoke that only a good dose of liquid courage can assist. 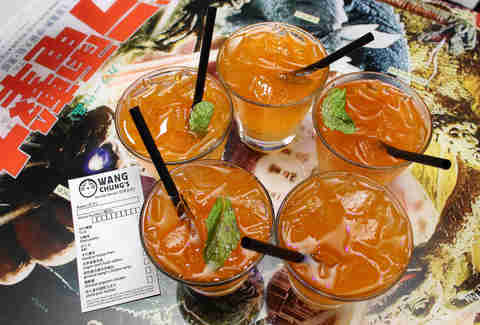 And Wang Chung’s sure does a good job of having tasty drinks. The Yuzu Me, Please is a fun pairing of yuzu jelly, house-made ginger lemon fizz, Thai tea, and vodka, and the Lychee Co-tini brings together the light milkiness of Calpico and lychee vodka and pear. Visit Wang Chung’s on Sunday 10am-1pm for brunch, where you can order mimosas by the pitcher with various fruit flavors. Brew’d gives gastropubs a good name with great food and a large variety of beer. With over a dozen beers on tap and literally hundreds of bottles, it’s a beer lover’s dream. And if that leaves you in a tizzy, the helpful staff can help you narrow down the options, or you can pay for 4-ounce samples. Not to worry if you don’t care for beer, Brew’d has some delicious beer cocktails that incorporate other liquors and taste delicious! The Half a Weizen is part St. Germain Elderflower liqueur, part fresh squeezed orange juice, and part German hefeweizen -- it’s light and crisp and oh-so-delicious. Thank Q Pocha appears to be just another Korean bar, but it actually has a surprising number of innovative drinks that are not only Instagram-worthy, but also taste really good, too. 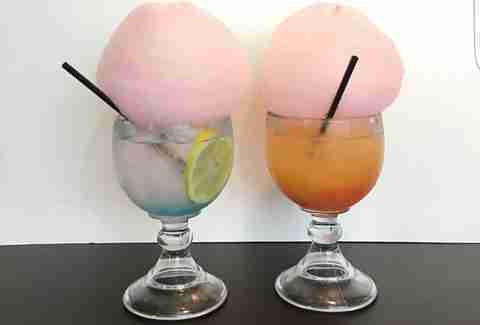 First up, the Magic Cloud (read: cotton candy) cocktails, which come in both lemon and peach flavors and pair well with their sugary toppings. The Shark Attack is an interactive drink made of vodka, rum, and Blue Curacao and features a plastic shark that you squeeze to incorporate strawberry puree into the drink. Other fun options include soju in the appropriate fruit vessel (e.g., apple soju in a hollowed-out edible apple cup). 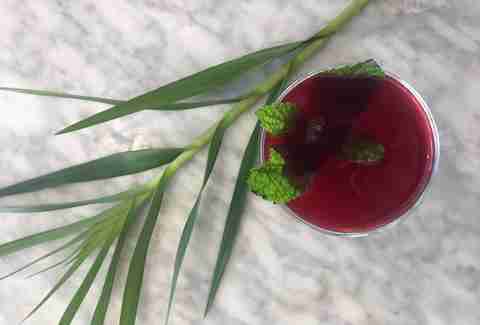 This former pop-up has become a trendy, critically acclaimed spot for Vietnamese cuisine that lives up to every bit of its hype. The Chinatown brick-and-mortar storefront is a family affair, owned and operated by the Le family that uses "Mama" Le's family recipes as the basis for their most popular dishes. The cocktail offerings don’t disappoint either. Try the eye-catching and palate-quenching Cobra Commander, made with avocado mezcal, a Sriracha ice cube, pamplemousse rose, and lime -- a spicy and smooth accompaniment to its fusion dishes. The downtown eatery is closed on the holidays but stop by its sister restaurant Piggy Smalls from 10am-3pm for your fusion cocktail needs. 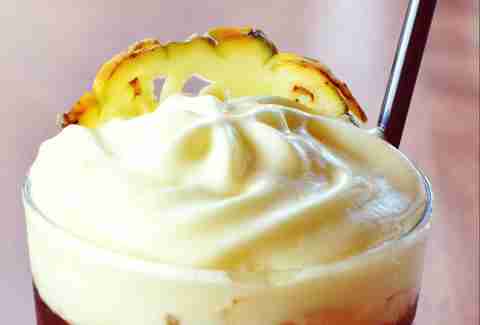 Ed Kenney’s Mud Hen Water is known for its delicious twists on traditional Hawaiian food using locally sourced ingredients, but it also has some really yummy drinks. 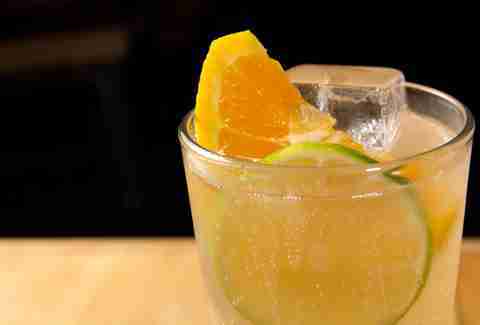 The Grapefruit Snap is delightfully bright, with a nice joining of vodka, grapefruit, ginger syrup, mint, and soda. If you’re up for something a little different, try the Kitchen Cocktail, the bartender’s concoction, which rotates daily. 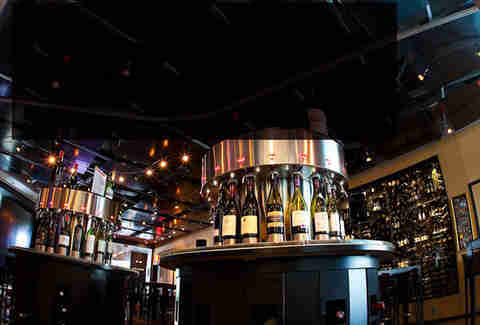 Amuse Wine Bar is the place to be if you enjoy drinking and sampling all kinds of wine. The premise is simple -- load up a wine card with money and then take your glass and pick out any wine you want from the 80 self-dispensing kiosks. 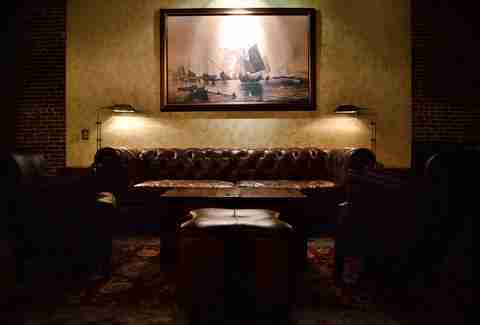 It’s a pretty swanky place, perfect for date night or a girls’ night out. Go ahead, treat yourself -- you deserve it. Home Bar is definitely synonymous with best bar food in Honolulu, serving up items like tater tot nachos, kalbi, and kimchi fried rice. With all of that killer food, Home Bar serves up the usual liquors, beers, and super good cocktails, too. Check out the WTF Martini, which is made like no other martini we’ve ever heard of: Grey Goose, fresh strawberries, simple syrup, soda, sweet and sour, balsamic vinegar, and freshly cracked black pepper. The sweetness of the strawberries is cut through by the sharpness of the vinegar and spiciness of the pepper. Another concoction ideal for sweets lovers is the Toasted Marshmallow, which is well worth your tastebuds: a sweet mix of marshmallow liqueur, marshmallow simple syrup, Calpico, and soda. You shouldn't judge this bar by its exterior. It’s located along Beretania Street and looks like an average dive from the outside. And, yes -- it looks like an average dive on the inside, too. But it’s so much more: pool tables, dart boards, karaoke, and to top it all off, great drink specials, and broke da mouth Chinese food (get the Fat Fat Special Chicken, you won’t regret it). Plus, they show all of the University of Hawaii football games that aren’t on TV for free. 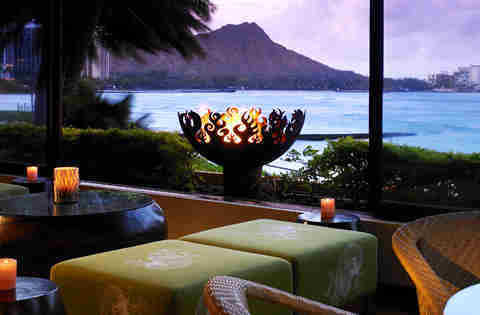 RumFire at The Royal Hawaiian Hotel is one of the best bars for gorgeous views of the water, Diamond Head, and sunset. By day, sit inside on comfortable lounge furniture, at the bar, or outdoors near the fire pits and sip cocktails highlighting local Hawaiian flavors, such as the Guava Lemonade carafe and the Lilikoi Cosmo. RumFire also offers Spiked Afternoon Tea every day from 1pm-4pm, which is decidedly a step up from the traditional English version. There are four tea cocktails to choose from -- Sweet Energy, Plantation Pineapple, Ginger Peach Green Tea, and RumFire’s House Tea. On weeknights, watch the sunset on the water with live music as your backdrop. On Friday and Saturday nights, the oceanfront lounge transforms into a beachside nightclub with live DJs, cabana rentals, and bottle service available. If not for anything else, you need to visit Sky Waikiki for a better look at the Hawaii sunset. 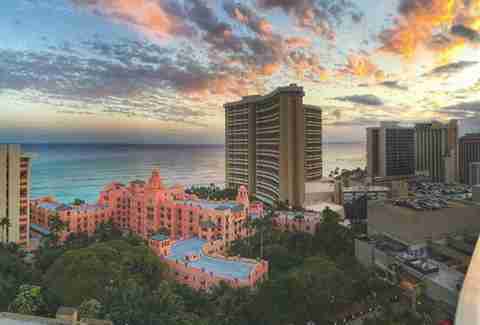 From 19 stories above Waikiki, you can sit and enjoy nature’s beauty in the outdoor seating area with a drink in hand. The cocktail menu has interesting beverage options, such as the It’s the Magic of Polynesia (hibiscus-infused Koloa coconut rum, Flor de Cana rum, Kahlua, pineapple, and lime). If money ain’t no thang, there’s always bottle service for big groups looking to celebrate. 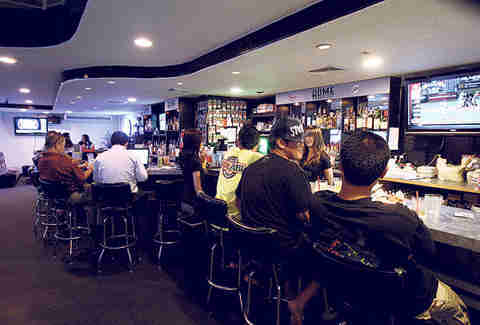 For those on a tighter budget, check out the happy hours from Wednesday to Sunday, 5pm-7pm. This new-ish spot near the University of Hawaii offers locally brewed craft beers that are made in small batches with some unique flavor profiles (e.g., li hing pineapple, basil lemongrass thai chili). Plus, it’s a BYOF (bring your own food) establishment even though they also sell a small menu of appetizers, so you can bring in snacks to pair with different brewed treats. Trivia nights, Scrabble, and Cards Against Humanity all add to the chill, laid-back vibe here. The sister restaurant to the popular Pig & the Lady, this global-inspired eatery offers a curated cocktail menu to compliment its family-style brunch, lunch, and dinner offerings. 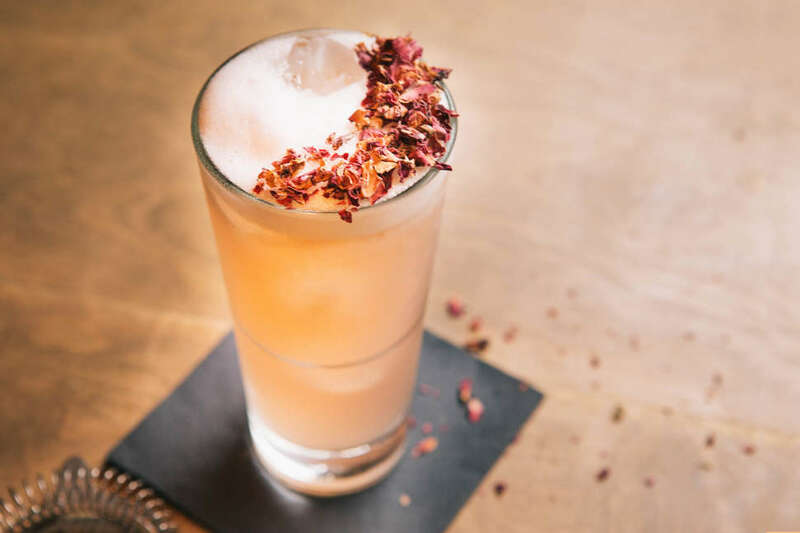 In addition to beer, wine, and house-made non-alcoholic beverages, you’ll find crafted mixed adult beverages like the Summer Breeze, a refreshingly sweet cocktail made with Hawaii sochu, fresh watermelon and hellfire bitters, or the smoky Play with Fire, made with bonded bourbon whiskey, peach, charred lemon, and fresh orange juice. The highlight of the cocktail list, however, is its slushy of the month -- a rotating, house-made slushy mixed with your choice of tequila, vodka, gin, or rum. Ed Kenney’s fourth establishment keeps in line with his motto of utilizing the best ingredients Oahu has to offer. Mahina & Sun’s craft cocktails list is small but doesn’t disappoint, with tasty options like the Lavender Rub, a boozy and refreshing mix of sherry and lavender bitters (but without an overpowering lavender flavor). The Market Special offers an alternative to their traditional list with a cocktail of the day. The mid-century modern interior provides a nostalgic ambiance while sipping their classic cocktails with a modern twist. Maybe this mid-century oasis sounds a little too good to be true: Stumptown coffee, artisanal cocktails, and a menu packed with fresh, Pacific Rim cuisine, without jam-packed crowds? 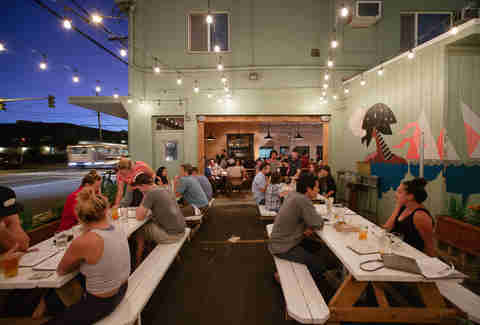 The open-air, low-key eatery doesn’t disappoint with its craft cocktails either. Find updated classics like the Mai Taime, which is their take on the ever-popular mai tai, but mixed with Old Lahaina Silver, Myers Dark rum, lime, house-made orgeat, tiki bitters, and a fluffy lilikoi foam. Or make new favorites like the Lime in the Coconut, a citrusy and refreshing blend of lime and coconut, of course, and mixed with Old Lahaina rum and mango boba. Leave the car at home because you’re most likely going to want to try everything here. The bar boasts 20 beers on tap (which are constantly changing), a revolving cocktail on draft, at least 40 beer bottles, wine craft cocktails and a whiskey list so long it’ll make you weep tears of joy. For cocktails, try the powerful 5th Amendment, made with bourbon, chartreuse, fernet, and lilikoi bitters, poured over a spherical cube of ice. 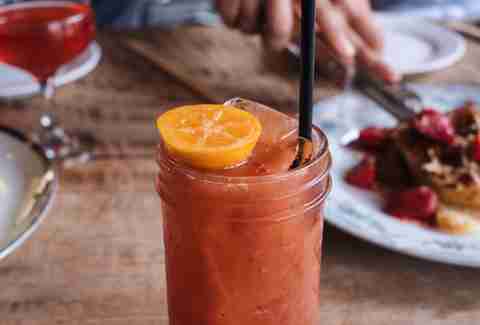 During brunch, you can spice up your chicken and waffles with a Kim Chee Who!, a Bloody Mary with a healthy kick of Sriracha, or opt for the signature Bloody Mary, served with a slice of bacon. This neighborhood brewpub opened in 2014, but it’s already hard to picture the island’s adult beverage landscape without it. 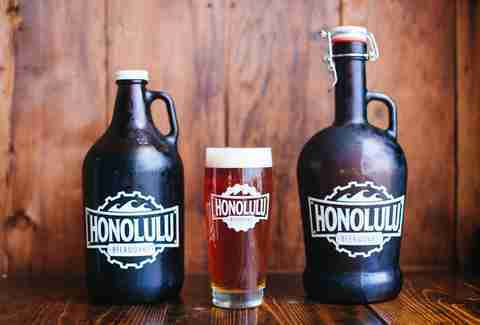 One of the first craft breweries on the island, it includes two outdoor beer gardens and open-air tables, making it a relaxing casual stop to hang out with friends and sip locally made beer. Beerworks uses local and imported ingredients, barrel-aging them in the brewing process to make seasonal ales, saisons, stouts, IPAs, porters, and limited-editions, which they serve as build-your-own flights, in pints, or filled in growlers to-go. Summer Nakaishi is a freelance writer for Thrillist whose favorite fancy drink is an Old Fashioned, but since she’s not really that fancy, she’d most likely be seen drinking some kind of stout beer.